Rome Early Christianity - HISTORY'S HISTORIESYou are history. We are the future. Many things contributed to the decline of Rome. As the Empire grew in size, it became more and more difficult to govern effectively. As Roman traditions encountered the different traditions of their distant neighbors and the newly conquered, their values were challenged. Leaders governing far away from Rome became corrupt, and it wasn't long before the corruption made its way to Rome. As Roman government became corrupt, people in the provinces eventually turned against Rome. That unrest, combined with increasingly hostile neighbors, meant that Rome had to spend great sums of money to support an incredibly large military. Those factors combined to create a perfect storm, and the changes that followed eventually helped bring the mighty Roman Empire to an end. What role did religion play in the decline of Roman power? Another factor that contributed to Rome's decline, especially toward the end of Roman rule was the culture shift that happened in religion. After Rome expanded into the Middle East, many Jews found themselves persecuted for their beliefs. Judaism is a monotheistic religion. That means that Jews believe in one almighty God. In Judaism, that single God is the highest authority. That Jewish belief ran counter to both Rome's polytheistic religious practices and to Roman law that placed the emperor as the highest authority. With its roots in Jewish tradition, the rise of Christianity only increased Rome's troubles. After the Romans conquered Judea in the first century BCE, they did not interfere with how the Jews worshiped. Even while the Roman Empire allowed Jews to practice their religion, however, in Judea and Galilee the Romans did make life very difficult for them. The Romans replaced the Jewish king with a Roman governor. That move made many Jews resent the Romans. Many Jews hoped God would send someone to free them from Roman rule. What events led to the Jewish diaspora? ​The Jews who lived in Judea and Galilee had different ways of dealing with the Romans. One group of Jews wanted to fight the Romans in order to win their freedom. These Jews were called Zealots. In the year 66 CE they rose up against the Romans. The Romans crushed the uprising in 70 CE and destroyed the Jewish temple in Jerusalem. Not long after, 960 Zealots took over an ancient mountain fort called Masada. For a time, the Zealots endured a siege of the fort by a powerful Roman army. Eventually, however, the Romans defeated the Zealots. In 132 CE, the Jews again rose up against the Roman rulers. And, once again they were defeated. This time, the Romans forced the Jews out of Jerusalem and told them they could never return. 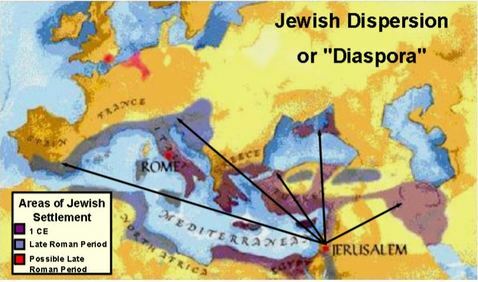 That series of defeats led to what is known as the Jewish diaspora, or dispersion of Jews to areas outside of their homeland. What did Judaism and Christianity have in common? The Jews were one of the few peoples to practice monotheism. The life - and death - of Jesus, a carpenter from the small town of Nazareth in Galilee, changed that. In about 30 CE, Jesus began to preach in Galilee and Judea. He traveled with a group of close followers called disciples. Jesus was Jewish, born and raised in a Jewish family. His teachings were based on the lessons of his Jewish faith. ​Jesus often preached using parables, short stories that made his ideas easier to understand. He taught that God created all people and loved them the way a father loves his children. Jesus also preached that God was coming soon to rule the world. For this reason, Jesus told people they had to do more than follow the laws of their religion. He told them they must also love and forgive others. His message strengthened Jewish teachings such as, "Love your neighbor as yourself." Leonardo da Vinci painted "The Last Supper" in the late 1490s. Brain Box: Why did the Roman authorities view the teachings of Jesus as a threat to their power? Jesus was also credited with performing "miracles." Because of his teachings and his actions, the followers of Jesus called him "Christ." "Christ" comes from a Greek word that means "chosen one." They believed that Jesus had been chosen by God to be his messenger. Because they refused to follow either Jewish or Roman laws, the followers of Jesus angered Roman authorities. As more and more people began to believe in what Jesus was saying and as his influence grew, Jesus became more dangerous in the eyes of Roman rulers. The Romans saw Jesus as a threat to their power. In about 33 CE, Jesus traveled with his disciples to the city of Jerusalem to celebrate the Jewish holy days of Passover. The Jews were tired of Roman rule and high taxes. The Romans were angry because the Jews would not worship statues of the Roman emperor. Jesus celebrated the Passover meal with his disciples. This event has come to be known as the Last Supper. After the meal, leaders in Jerusalem arrested Jesus. Jesus was accused of disloyalty to the Roman government. He was sentenced to death by crucifixion. That meant that he would be hung from a wooden cross until he died. According to Christian belief, three days after Jesus died, he rose from the dead and appeared to some of his followers. The disciples of Jesus still thought of themselves as Jews. However, the message of his resurrection, or coming back from the dead, led to the birth of Christianity. Who spread the teachings of Jesus? The apostles were early Christian leaders who spread the teachings of Jesus after his death. People who accepted these teachings came to be known as Christians. Early Christians met in people’s homes. These gatherings were the first churches. Two of the most influential leaders of the early Christian church were Peter and Paul. Tradition says that after Jesus died, Peter went to Rome and set up a Christian church. Became a disciple of Jesus. Went to Rome and set up a Christian church. Opposed Christianity, even persecuted Christians, insisting they be locked up. Became a Christian after seeing a light and hearing the voice of Jesus. Paul was an educated Jew. At first, he tried to stop Christianity from spreading. Then one day, according to Christian writings, while he was on his way to the Roman city of Damascus in Syria, Paul saw a great light and heard the voice of Jesus. After that experience, Paul became a Christian. He spent the rest of his life traveling from town to town, spreading the message of Jesus wherever he went. Christianity grew out of the Jewish religion. Both religions believe in the God of Israel and draw their teachings from the Hebrew Bible. However, many Christian beliefs are different from Jewish teachings. For example, Christians believe that Jesus is the "Son of God." Jews do not. Another important difference is the belief in salvation. Christians believe that people who accept Jesus will be saved from the consequences of their wrongdoing by being forgiven for their sins. After they die, they will go to heaven and one day be resurrected the way Jesus was. The basis for the Christian faith is the Trinity, which means "three." In Christian belief, this refers to the three persons of God: the Father, the Son, and the Holy Spirit. The first followers of Jesus taught his messages to Jews and non-Jews in the Mediterranean region. From there, Christianity spread throughout the Roman Empire. This happened for many reasons. A network of roads made long-distance travel fairly safe and easy. The people who lived under Roman rule spoke Latin or Greek. This made it easier for Christians to share their ideas. Another reason for the spread of Christianity was that it appealed to people. Christianity promised a better life after death. It gave people hope, something the Roman religion could never do. Christians taught that people’s sins would be forgiven if they became Christian. This message was not successful with many Jews, but many pagans responded to the idea of Christian salvation. Christian communities also took care of the needs of their members. The Roman road network made travel easy. The Romans kept the empire peaceful. Most people understood Greek or Latin, so communication was easy. Christianity offered more hope and security to people than did the official Roman religion. At first, the Romans did not mind that Christians did not worship their gods. The Empire was prosperous and there were not many Christians. Over next two hundred years, however, Christianity spread. When barbarian warriors began to attack the empire, many Romans suggested that the attacks were coming to the empire because a growing group of Christians did not worship the Roman gods. As a result of the unrest, Roman emperors became increasingly intolerant of Christianity and took steps to stop Christianity from spreading. Rome came to see the new religion as a dangerous threat to its empire. Christians refused to worship the emperor as a god. Christians also refused to serve in the Roman army and were against war as a way to solve problems. For these and other reasons, Christians were arrested, beaten, and sometimes killed. Some Christians became martyrs, people who were willing to die rather than give up their beliefs. In 202 CE, Emperor Septimius Severus banned any Roman citizen from converting to Christianity or Judaism. Those who disobeyed the emperor were often tortured by soldiers or wild animals at sporting events. Despite the persecutions, Christianity continued to grow. Which Roman emperor declared religious freedom throughout the empire? ​In the early 300s, the emperor Diocletian made one last attempt to destroy Christianity. He failed because Christianity had grown very strong. In 312 CE the new religion took a major turn. The night before an important battle, the Emperor Constantine had a dream. In his dream he saw a flaming cross in the sky. The next day he had his soldiers paint a cross on their shields. After his army won the battle, Constantine believed that the Christian God had helped him. In the Edict of Milan, issued in 313 CE, Constantine gave religious freedom to all religions in the empire, including Christianity. Constantine became a strong supporter of the faith, eventually converting and becoming a Christian himself. He went on to commission the building of the first Christian church in his capital, Constantinople. The Hagia Eirene, which means “Holy Peace,” was built on the site of an ancient Roman pagan temple. In modern Istanbul, the Hagia Eirene stands on the place of a Roman pagan temple. Constantine built more churches in Jerusalem and Rome. He also let Christians serve in the military and work in the government. Constantine even allowed Christians to stop paying taxes. After Constantine's rule, the emperor Theodosius outlawed pagan Greek and Roman religions and, in 392 CE, he made Christianity the official religion of the Roman Empire. How was the early Christian church organized? The early Christian church had to become better organized in order to unite its many followers. It also had to make sure that Christian communities shared similar beliefs and practices. Early church leaders used the Roman Empire as a model. Like the empire, the church was ruled by a hierarchy of officials. A hierarchy is an organization with different levels of authority. Leaders of the church were known as the clergy. In the early church, only men were allowed to be members of the clergy. Regular church members - the worshipers - were called the laity. In this hierarchy, archbishops had the most authority. Priests had the least. The five most powerful archbishops were each in charge of an entire city. These leaders were called patriarchs. The bishops decided the true teachings of the Church. Accepted teachings became doctrine. Teachings that the bishops rejected were heresies. Those teachings that the bishops deemed heresies were teachings that went against the Christian faith. What role did Paul and Augustine play in the early Christian church? Church leaders also preserved stories about Jesus and the writings of the apostles. By the beginning of the 4th century CE there were four accepted accounts of the life and teachings of Jesus. Christians believed four apostles of Jesus wrote those accounts, or gospels. The word gospel means “good news.” The Bible's New Testament includes the four gospels of Matthew, Mark, Luke, and John, as well as the writings of other early Christians. The Bible's Old Testament is the Greek version of the Jewish sacred writings. The Christian Bible consists of the Old Testament and the New Testament. This earliest known painting of Augustine dates to the 6th century. Two of the most influential early Christian writers were Paul and Augustine. Paul’s writings are part of the New Testament. Augustine is one of the "Church Fathers." These writers and thinkers played an important role in explaining and defending the teachings of Christianity. Writing at the end of the 4th century CE as Rome's power was in decline and as Roman towns throughout the western Empire fell into states of decay, Augustine's works, in particular, established the idea that the church represented a "City of God" where people in the middle ages could take refuge and find security and peace. What led to the schism within the Church? As the Church grew, the bishop of Rome came to believe he had authority over all the other bishops. By the year 600 CE, the bishop of Rome had the title of pope. Pope is from a Latin word that means “father” (from which we also get the word "Papa"). Christians in the western part of the Roman Empire accepted the pope as the head of all the churches. In time, the pope took on enormous political as well as religious power. Christians in the western part of the Empire spoke Latin. Christians in the eastern part of the empire spoke Greek. They did not believe the Pope had authority over them. By the 11th century, those differences led to a permanent schism in the Catholic church. Churches in the west formed the Roman Catholic Church. Churches in the east became the Eastern Orthodox Church.